There’s an interesting debate about a recent book review – a suggestion that the review of a book about Adolf Hitler is actually a thinly-disguised attack on Donald Trump. It’s caused some interesting debate online, with points being made for and against the statement. (The review itself doesn’t mention Trump at all.) And while I join many others in thinking that Hitler comparisons are overblown at best and nonsensical at worst, it does actually raise an interesting point that should not be forgotten. What is the difference between Adolf Hitler and Roderick Spode? Well, quite apart from the fact that one of them is fictional while the other was all too real, there’s one very important difference. 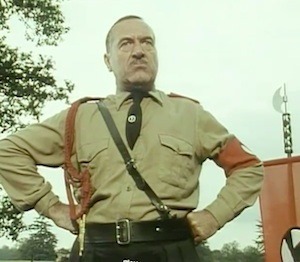 Hitler had a massive support base – one pre-1933 estimate suggested that the Nazis were supported by at least a third of the entire German population – while the fictional Spode’s ‘Black Shorts’ were little more than a handful of thugs. Spode is a figure of fun precisely because he’s largely harmless. But if he had even a tiny percentage of the following Hitler had, how long do you think Wooster would have been permitted to make his smart remarks? Hitler was often treated as an absurd fellow by the German (and outside) political elites. And yes, there was something faintly comical about him. What those idiots missed was that Hitler enjoyed a large and devoted following. Germany was in deep trouble. Hitler saw opportunity and took it, putting himself at the forefront of a revanchist movement that wanted to seek better times. And while it is possible to dismiss Hitler’s rise as a series of unlikely events, such a view dismisses Hitler’s own agency – the remarkable skill he showed in analysing his opponents and snatching opportunities when they appeared. But without his following, Hitler would have remained a joke. Let us pretend, if we can engage in a counterfactual analysis, that Hitler died (or was assassinated) in late 1932. This would obviously have terminated Hitler’s rise to power. But would it have made the ultimate source of his power go away? Those people who supported the Nazi Party – the poor, the desperate, the power-hungry – wouldn’t vanish when Hitler died. Their support would have been lying on the ground, waiting for someone to come along, say the right things and pick up where Hitler left off. Hitler was not the cause of Weimer Germany’s problems, although it’s pretty much inarguable that he made them worse. The Nazis could not, I think, have made a reasonable bid for power in normal times. No, Hitler was a symptom of political and economic decline – and essential helplessness – caused by matters outside Germany’s control. The (seemingly unfair) belief that Germany had been unjustly punished after the Great War, the (equally unjustified) belief that the German Army had been stabbed in the back by politicians and Jews; economic collapse, depression, starvation, hunger … those problems existed before Hitler was anything more than a minor street orator. And they wouldn’t go away if some kindly soul assassinated Adolf Hitler before he took power. Perhaps Germany would have been better off without Hitler. Most people wouldn’t consider it something that could be argued. But it’s quite possible that Hitler’s successor might have been worse. The stresses and strains that propelled Hitler into power would have had a chance to get worse. Trump is not Hitler. The comparison is odious; misleading at best, downright spiteful at worst. But Trump and Hitler do have one thing in common – they are both symptoms, not causes. The Republican Party saw fit to ignore the concerns of a significant percentage of its core voters. Trump, the supposed clown and idiot, saw opportunity in appealing to those voters and took it. Those voters will not go away if Trump loses in November. Their concerns, their legitimate concerns, will not be addressed. And they will stay angry because no one seems to be taking them seriously. Trump simply cannot be dismissed. This is a man who won the Republican nomination by beating fourteen of the most powerful Republicans in the country. He could not have done that without a vast support base. (Note how Jeb Bush crashed and burnt.) And while it is tempting to make fun of him, it is important to remember that he won the nomination fair and square. Trump cannot be dismissed. You may feel that Trump is a monster. But remember – drowning men will clutch at any straws. If Trump wins, he will have to address the concerns of his base. This will not be easy, even with the best will in the world. But if he loses, those concerns will not go away. And the next person who rises to take the lead may be far worse. To make matters “interesting”, to a large segment of the US the Democratic Party is seen as the Party of Voter Fraud. IE Chicago where the dead vote Democratic. If Trump loses the election, there could be plenty of people openly mad at the Democratic Party for “stealing the election”. President Hillary could find herself considered an “illegitimate” President and her “charming” NOT personality would make matters worse for her. It is a problem for the modern world, how to stop free trade and globalisations negative side effects devastating sections of the population to such an extent they turn to extremes who offer simple answers and targets to blame. @Paul More “interesting” that Trump made Democratic party that through his talk of if he losses then it must be by Voter Fraud. Thus Trump have to win to be no Voter Fraud. Very self centered thinking that he can’t lose and sore loser in that then making Hillary “illegitimacy” in question if he loses. Hitler may have 30% support but Trump has 40% that will vote for him even through all the lose talking that is damaging to himself (self-inflicted). Same as Hitler he does not take advice from people around him, same as Hitler he can’t control his personal hate when he feels attacked, same as Hitler he can’t be wrong on any issue and same as Hitler he has the speaking presence for his supporters to keep supporting even with his character faults. Also same as Hitler the elites and intellectuals saw the dangers but Hitler base still dismissed all that and supported him throughout WWII. It look like Trump supports will do the same. Most of all he can win as Hitler won. Well Don, I take comparisons between Trump and Hitler with a ton of salt. Besides the Fact that Democrats and the News Media are always calling Republicans Fascists/Nazi, there have been plenty of cases where the News Media has been caught lying about what Trump said. Sadly, because of the American Liberals use of the Fascist/Nazi label when it doesn’t fit, I think it would be poetic justice if they had to deal with a Real Hitler (even if I don’t think Trump is one). Note, I don’t like Trump. I just think he’d be better as President for the US than Hillary Clinton. Don Yu, your reply is exactly that type of nonsense that causes conservative’s like myself to dismiss Democrats as irrational, arogent and sometimes just plain narcissistic. The Democratic party platform and leadership, since our civil war, has destroyed the foundation and ideals of Anerica and our government. The majority of it’s members vote for only their own gain, ultimately empty promises or believing they are intellectually superior to others and therfore should promote an idealized form of central government. On one hand the promises can not be kept becuase a carrot needs to be used over and over and the other is ultimately the view of a Dictator. I do not personally approve of anyone running in this election or our two-party sytem which allows us to only vote for mostly self-entitled full time politicians and lawyers. Donald Trump is winning votes purely because he is anti-establishment but he had only accomplished that because of his own wealth and resources. He nor Clinton are NOT “of the people”. But, your statements are typical of many or most democrats I have spoken with both friend and enemy alike. You have resorted to making up facts or purposely saying untruths and throwing around Hitler statements like you have any clue as to what a Hitler, Mussollini, Stalin, Mao, Pol Pot and others were really like, sick and twisted murdering Dictators. You are trying to make a completely artificial and ignorant statement comparing Trump to Dictators, Facsicst, Communists, etc., that all were responsible for killing MILLIONS! Every single instance of these governments have killed their own citizens and lied to them through propaganda. Every single one. Every government that becomes a federal institution cannot stand for dissent, every statistic must fit into their role and position in life. Only criminals and phsycopaths end up running those goverments. Look ar Russia! The greatest example of criminals and despots leaving a sinking government and creating a new one of corrupting an criminal behavior all because the Communist government was never held accountable to its citizens. They were allowed to just walk away and take their same actions under a so-called democracy. Hence, Democracies must be renewed with blood, like Hungary, Romania, etc. Name calling, no facts or basis in truth is ultimately the typical goto response for many liberals and so-called intellectuals. Real adults and intelligent indivduals see the world and individuals as there truly are they do not see it for what they believe it should be. They do not use words such as they, everyone, them or in terms and just assume that because an outlier is an issue then everyone in a “made up ” group has an issue. It is convient for you to make incredulous statements by saying Trump is the same as Hitler. I would guarentee that you are someone that believes most or all his friends are rightous but believe most white people are racsist becuase out of 100’s of millions of people you see the few incidints that actually occur and assume most are like that. That is the fallacy today that is liberalism. An entire base of people that, despite what is in front of their own face, believe they know better than others and how they should live all while spouting inclusion. In reality, Democrats are grouping everyone into smaller and smaller parties, hispanic, white, african american, male, female, asian, indian, American indian, etc. creating and forcing divisiveness upon American citizens. Just how many types of Americans can America have? How many can you fit into nifty little voting blocs while offering them empty platitudes and promises. Do you not expect division or mistrust to occur while a government continues to define people into statistical groups. A Federal government that has taken almost all local rights for itself and is far, far removed from it’s individual citizens. You no nothing of our real American History since our civil war. Did you know that a Democratic President used a depression to create America’s Federal Socialist programs? And that they failed and continue to fail today while WWII really got us out of that depression. That it is a FACT he called it proggressanism and met with Hitler and Mussolini before WWII and they all agreed that they believed in the same ideals? That the Democratic platform of Progressanism was and is the same as Socialism and Facsicm. It is a fact that they Democratic Party only distanced themselves from Hitler and Mussolini becuase of WWII and what it would look like while not changing the platform at ALL! I won’t even name these disgusting Democratic presidents that are tearing America apart and have been for over a century. These are INSTITUTIONAL problems within the democratic party, it is the new PC form of racism. The American Democratic party fought our equal rights amendments, then enacted Jim Crow laws and segregation was in south and ghettos and “Fences” in the North. Now they continue to create divisions. In the north and south they had and still have criminal and mafia infrastructures backing candidates. Again, INSTITUIONAL parts of our Democratic Party. You may not like the Republican party but at least with the Republicans you know you may have bad apples but not a party that as a platform has stood for division of people and socialist ideals, while preaching the opposite, as a very real part of the party itself. A party that has been and is still aligned with Socialism and Fascism. It is Americans who think like you do, without real thought or understanding of the realities of life and government that have destroyed the idea of America. Democrats have voted against libertarians and conservatives to handover our peoples right to govern themselves and local powers to a Federal Government. A government which has grown massive and is now an undying buerocracy, larger than any politicians or even a party. You and others that think like you have turned American citizens Into statistics. Ultimately the democratic party has always been full of both Intellectual’s that belive know best for ALL Americans like Hitler and criminals. Try to intellectually Deny that! You can’t, it is facts, it is based on the promenant members, the actual platforms and the establishment of the Democratic party. I think you are only seeing one side of the coin. While I agree that Trump’s worse enemy is his mouth, Hilary is a known product and I have to say that the product is more then rotten. I do not know if you where around in 1993 when he husband was sworn in or lived in Arkansas before that as I was? The scandals during his time there involved both of them not just Bill, so it was during the 8 years of his presidency. We do not need this again or country is not as strong as it was at that time. You will say why was he voted in and my answer is that then as now he was voted in by people that did not know him or the job that he did in the past, that and a strong 3rd party conservative candidate. What Trump brings to the plate is something new, more importantly someone new to political scene. This is what people like myself have been looking for. Also I do not know where you live and this is important because while our government gives out that rosy economic news and that might be true in New York or California but here in the South and in much of the Midwest it is tough unemployment is in a lot of place at near or above altimeter high, farm prices are not keeping up with the cost of planting and upkeep. While everything else is higher and higher our wages have been static for years and years and years. AND if you are like the folks on social security, retired on a fixed income it is a no win situation. So this is why people have heard and then listened to the message of Trump, but trust me, no trust them we are not stupid and we are far from weak because if he don’t work out the we will try someone else. One way or the other. I did not expect so strong reaction. My comments was not end all as it is only surface comparisons. I don’t think that Trump has the ruthlessness and unending ambition to keep power at any cost. As well as strongly weaken government institutions that is not willing to protect the constitution. There are people who are willing to protect minorities against people who attack them and those attacking people are not majority as in Hitler Germany. But as purely only as a politician and public speaker Trump as I said and you as example fire up their support base to defend them so passionately. Don, I’ve heard this “but I didn’t really mean :person mentioned: was a Real Hitler” before. Not really. It’s more extreme dislike of the “he’s a Nazi/fascist” attack used too many times by Liberals against Any Republican/Conservative. and what Trump can realistically do to address concern of her base ? Trade war would not restore Rust Belt, harassing immigrant might open some low wage jobs, but more jobs will be lost. Trump standard Republican economy program would help super rich but not help his supporter at all. Trump have no program to restore wealth to his supporter. I think we just to have accept that Government can’t restore prosperity to region in decline. Democrats try that to inner city. Germany try that to East Germany. Japan made numerous attempt to restore village prosperity. It all failed to work. The cause is simple. Prosperous area attract youth. Young people with their invention, risk taking, labor, and consumption generate economic activity. Economic Activity make area prosper. Tokyo region is growing. Berlin growing. So does Top hundred of American Cities. this absorb youth from surrounding area. Government should see to its entire citizen prosperity. Thus US fed government should prioritize all America above Detroit. German should prioritize all Germany above Mecklenburg. Government is not all powerful, and it lot cheaper and effective to help entire citizenry, rather than keep throwing money at declining area. Support pension, medical care, disability, schooling in declining region. But realistically if you had healthy body and under 40, you should move if you want jobs. And government should support moving instead of keep trying failed programme. I think Trump supporter, North Englander have unrealistic hope of what government could do. Note: I support socialist programme mainly because of automatization and better AI, I don’t see any realistic way to prevent very large number of people to be permanently unemployed. I think they deserve to live in comfort, but I don’t see any way to make them useful and live outside welfare check. They still can do a lot of things, while more demagogic and far (not extreme) rightwing movements are on the rise in most western countries since 2008. While hitler comparisons are just impolite and impropper at best they are both demagoges. . and populists but really there are few politicans in any democracy who aren’t populists in so far as they depent on their voters option in just depends a bit on how far they go. my fear is that Thrump wins and finds that he has actually little to offer to the working poor he might think that he needs a distraction to stay in power for the second election. that is at least in favor of the american system that a presedent has only 8years of time to ruin the country. after all the changes in the global economy over the last 30 year’s are a megatrend and no single party nation or politican can deny them, or change them majorly.. they can only cushion the impact. http://www.pewresearch.org/files/2014/01/FT_COTW124.png the elephant in the room or one of them. the world has managed to put roughly half the number of people without food or in absolute poverty over the last 3 decades. But these new middle-class on a global scale is of course a competition for the middle class in the developed country’s and so the jobs and their loans got lower or stagnated. Who could be worse the Adolf Hitler? How about a communist Germany allied with the Soviet Union? It’s forgotten now, but there was a time when the Communits vied with the Nazi’s for control of Germany. Without the leadership of Hitler, would the Communists been able to destroy the Nazi party and dominate Germany? If so I think that the world today would look very different. Would the German Communists be the sort to ally with the Soviet Union presumably by this point under Stalin? Propaganda, that is what lead to the rise of the NAZIs and no I’m not talking about Nazi propaganda, I’m talking about the propaganda of the first world war. The German government kept telling the public that they were winning then over night it became oops we lost. Conspiracies became easy to believe. Jews, bankers, or anyone else that seemed to be doing better than you must have profited from Germany losing the war. In the 1920s people were looking to blame someone and were willing to accept anyone who had a simple answer to their complex problems. Germany was going to go either fascist or communist in the 1930s and the Holocaust was already baked in because of the lies of the Kaiser’s government. Even if Hitler had stuck to painting his sh#tty little painting someone else would have taken the reins of power.